Some opportunities come once in a lifetime. 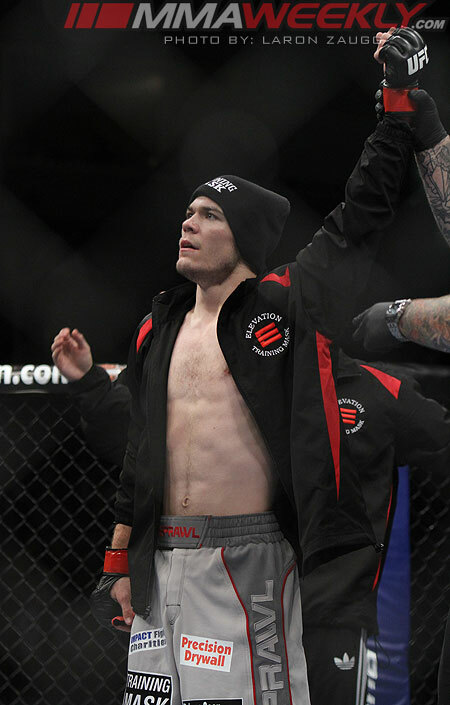 For Michael “Mayday” McDonald, one such opportunity came at UFC 145 against Miguel Torres. McDonald floored the former WEC bantamweight champion with an uppercut and followed with a few punches that left Torres motionless in the Octagon. Back just four years ago, McDonald envisioned fighting then world champion Torres as he was cutting his teeth in the Gladiator Challenge promotion. But as UFC 145 came to a close, the 21-year-old’s heart was overwhelmed with joy at finally having his day in the sun with Torres. “I really just tried to have a good time,” McDonald told MMAWeekly Radio. “A lot of the times people try to intimidate their opponents and there’s a lot of emotions involved. I’m not scared and all this kind of stuff, but you know what? There’s always nerves and rather than trying to intimidate everyone with, ‘I’m not scared, I’m going to kill this guy,’ that just clouds your judgment. It just clouds your mind. I’m not all about the mean mug and the, ‘I’m not scared, I’m going to kill you,’ kind of thing. For many fighters happiness is getting to live their dream of fighting in the UFC as a career, and for McDonald, it’s really not any different. But to succeed, a fighter needs confidence. And sometimes that confidence isn’t always easy to achieve. In his prior fights against Chris Cariaso and Edwin Figueroa, the bantamweight felt stressed and lacked some of the confidence he needed to get the big finish over those opponents. Things have turned around for McDonald, however, as happiness has overcome a lot of his past anxieties and he believes that he’s become more dangerous as a fighter just by having a smile on his face. “The key to me winning is being happy and this job is probably the crappiest job you can do if you’re not having fun. Getting punched in the face and getting worked until you can’t move anymore is probably the worst job you can do on the planet if you don’t like it and you have to enjoy it,” said McDonald. “When I’m dangerous, when I’m a good fighter, and when I’m successful, I’m happy. I’m having a good time. That’s when I’m the most dangerous and what makes me happy has a lot to do with who I think I am.